Habit: Generally erect to ascending, [sprawling, pendent, or decumbent], branched or not, branches generally few--500, occasionally in dense mounds. Stem: 5--60 cm, (1)4--15 cm diam, spheric to long-cylindric, soft, not regularly segmented; ribs prominent, 4--13, tubercles +- 0 along rib-crests. Spines: 4--55 per areole, < 2 mm diam, needle- to dagger-like, glabrous to puberulent, straight, curved, or curly; central spines (0)1--6(9). Flower: lateral, near distal margin of spine cluster; perianth purple to lavender, orange, or red [yellow or green]; ovary glabrous, spiny, scales minute. Fruit: spheric to obovoid, indehiscent or splitting laterally, densely spiny, spine clusters deciduous. Seed: 0.8--2 mm, obovoid to +- spheric, dull, wrinkled or tubercled, generally black. Habit: Clump-forming or loose, open mounds generally < 0.7 m diam. Stem: < 60, 5--45(70) cm, 4--9 cm diam, cylindric; ribs 10--13; tubercles +- 0. Spines: (8)15--20 per areole, color and shape variable; central spines 2--7, straight to twisted. Flower: short-funnel- to bell-shaped. Fruit: 20--30 mm, spines glabrous. Chromosomes: 2n=44. Ecology: Dry habitats; Elevation: < 2400 m. Bioregional Distribution: SnBr, PR, W&I, D; Distribution Outside California: to Utah, Arizona, Mexico. Flowering Time: May--Jun Note: Highly variable, occasionally unclearly divided into varieties, needs study. 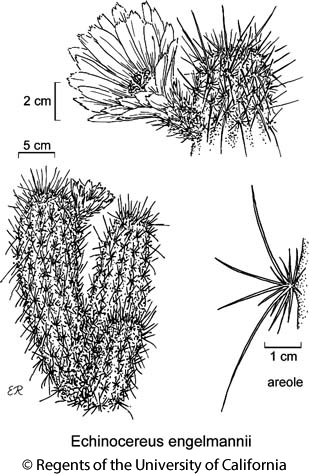 Citation for this treatment: Bruce D. Parfitt 2012, Echinocereus engelmannii, in Jepson Flora Project (eds.) Jepson eFlora, http://ucjeps.berkeley.edu/eflora/eflora_display.php?tid=23751, accessed on April 19, 2019. SnBr, PR, W&I, D; Markers link to CCH specimen records. Yellow markers indicate records that may provide evidence for eFlora range revision or may have georeferencing or identification issues. Purple markers indicate specimens collected from a garden, greenhouse, or other non-wild location.